Police officers walk ahead of a march in 2012 in London. The Economist reported last week, in an article on armed U.S. police, that “last year, in total, British police officers actually fired their weapons three times.” The number three resonated when the private autopsy of Michael Brown, the teenager killed by Ferguson, Missouri, police officer Darren Wilson this month, concluded that Brown was shot at least six times. Many tweets contrasted the numbers, saying Wilson had fired more shots at Brown than British police officers discharged in all of 2013. The point, that British police officers rarely fire guns, is true — most officers there aren’t allowed to carry guns. But the comparison with Wilson’s shots that hit Brown isn’t exactly right. The Home Office, the U.K. agency that oversees policing, publishes data on the use of firearms by British police officers every 12 months. The latest report, covering the 12 months that ended March 31, 2013, includes just England and Wales, not Scotland — which took over responsibility for police services in 1998. In England and Wales over that period, police officers fired guns in just three separate incidents, not counting discharges for training or “animal destruction,” according to the Home Office. That doesn’t necessarily mean the officers fired just three shots. The Home Office doesn’t report any further detail on the incidents. One incident could involve firing but not hitting anyone; hitting people with one or two shots — as did fatal shootings by police in 2011 and 2012; or shooting eight times and hitting someone six times, as police did in a fatal shooting in 2005. No matter how the numbers are counted, English and Welsh police officers fire guns much less frequently than do their American counterparts. Not every U.S. police agency reports discharge numbers. But the New York Police Department does. In 2012, 60 NYPD officers fired weapons in 45 adversarial incidents, injuring 14 suspects and killing 16. There were another 21 unintentional discharges and 24 shots in animal attacks, adding up to 444 total shots fired. That’s 15 times as many shots fired in adversarial situations as in England and Wales, in a city with one-seventh the population. 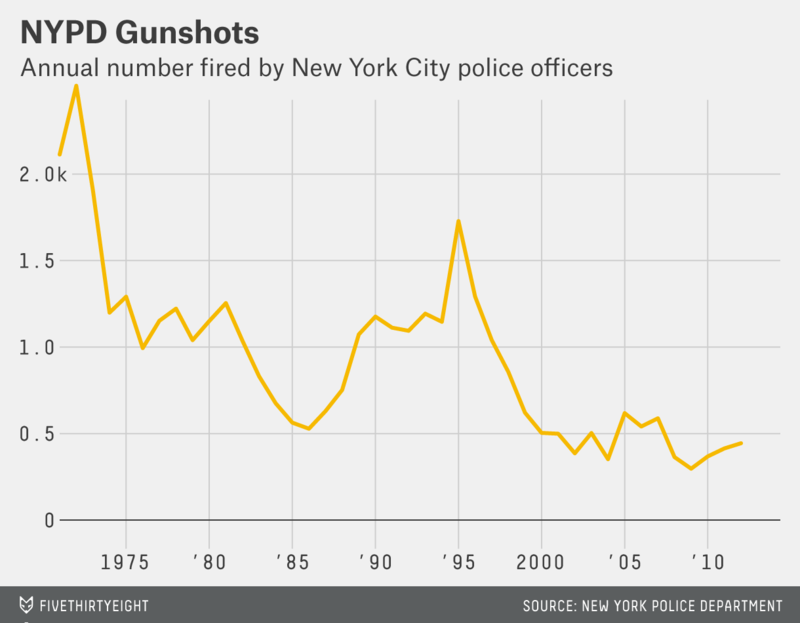 And New York City cops fire guns much less frequently than they used to: There were one-fifth as many gunshots in 2012 as in 1971, the first year for which data is available. British police officers shoot guns so rarely because most don’t carry firearms, and those who do carry them do so only in authorized operations. 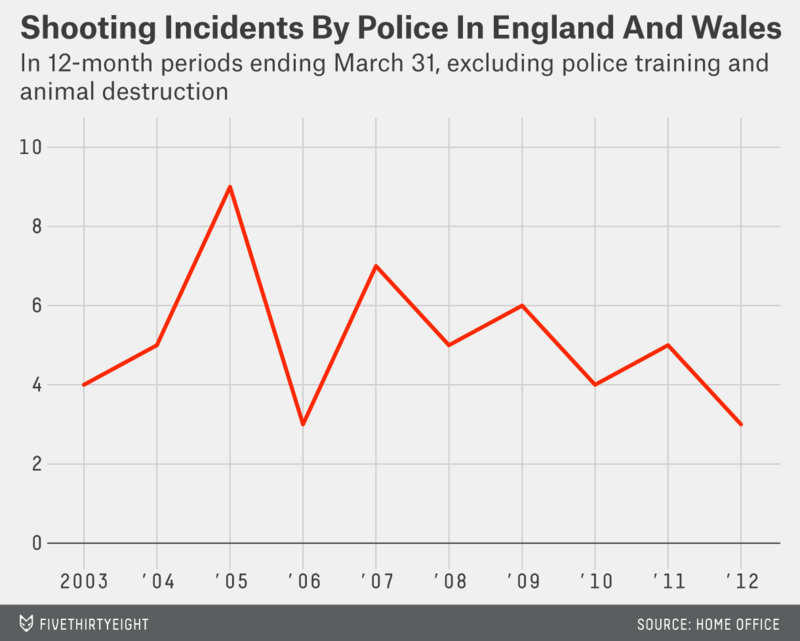 In the year that ended March 31, 2013, 6,091 English and Welsh police officers — about 5 percent of the total number — were authorized to carry firearms and did so in 10,996 operations. Increasingly, though, British police officers are carrying Tasers, which use electrical current to incapacitate people. Khan said Tasers aren’t replacing firearms, but instead are supplanting batons and tactics that don’t require weaponry. Police officers used them more than 10,000 times last year in England and Wales, more than three times the number of uses in 2009, according to the Home Office. However, she said, major incidents appeared to be on the decline so far this year, based on news reports. In the decade through the end of last year, the IPCC counted 11 deaths and 179 injuries, many serious, linked to Taser use by police — though investigations of eight of the deaths found none was directly caused by Taser use. Another 493 complaints about Taser use were referred to the commission. Taser International, which makes the eponymous devices, cites research finding that only 1 in 400 uses of Tasers cause significant injury. Taser International has in the past attributed deaths following Taser use primarily to drug use by suspects. 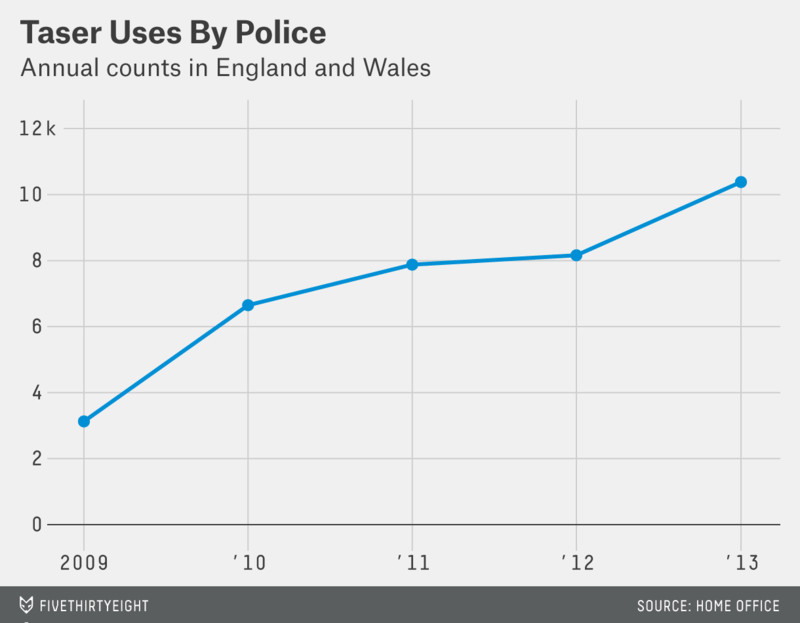 Even with Tasers, the numbers pale before the U.S. equivalents. Amnesty International counted 540 people in the U.S. who died after being shocked with Tasers between 2001 and early 2013. That’s an annual, per-capita death rate roughly seven times the one from police officers in England and Wales.